The political arrangements in Lombardy, Mantua and Venetia are shown in this diagram. Collectors are sometimes surprised to see the term "Austrian Italy", used to refer to the stamps issued by Austria in Lombardy-Venetia. This term is historically inaccurate and misleading, as Austrian Italy, prior to the creation of the unified Kingdom of Italy in 1861, always meant a much larger area. In fact, Italy as we know it today, did not exist prior to 1861. Instead there were several sovereign states which had crystallized from a soup of small independent states, free cities, feudal seats and warring principalities of the Middle Ages and the Renaissance. The decisive break came in 1525 with the defeat of the French by the Germans in the battle of Pavia and the subsequent siege, occupation and plunder of Rome in 1526. This left the Habsburg Charles V, Holy Roman Emperor and King of Spain, undisputed master in Italy. It was in consequence of these events that Southern Italy and a large part of the North came under direct control of the Habsburgs. With the division of the Habsburg Empire into a Spanish and an Austrian realm in 1556, the Italian possessions came under Spanish dominion and remained so until Charles VI of Austria, exhausted from the long wars with France over the Spanish succession and realizing the impossibility of recombining Spain and Austria under one sceptre, renounced his claim to the Spanish crown in the peace treaty of Utrecht in 1713. The Habsburgs recognized a secondary line of the French House of Bourbon as kings in Spain, but the Spanish possessions in Italy had to be given up to Austria and her allies. Thus Lombardy (the former Duchy of Milan), the Kingdom of Naples, and the Island of Sardinia came into Austria’s possession, while the Island of Sicily was given to the Dukes of Savoy. Soon, in 1718, Austria forced Savoy to exchange Sicily for Sardinia and as compensation the Duchy of Savoy was raised in status to a Kingdom, known from 1720 as the Kingdom of Sardinia. Under the treaty of Vienna of 1738 (ironically, made to settle a war over Poland) the most far-reaching changes were made in Italy. Again entire kingdoms and duchies were merrily traded. Austria gave up Naples and Sicily, and an independent Kingdom of the Two Sicilies was formed with a secondary line of the Spanish Bourbon family as rulers, who had to pledge never to unite with Spain. In compensation, Austria received the duchies of Parma and Piacenza in Northern Italy. Then a most important arrangement was made with regard to Tuscany, where the last Grand Duke of Tuscany of the famous House of Medici had just died. The duchy fell by law of inheritance to the crown of France. This enabled France to conclude a profitable deal. While she had little interest in becoming an Italian power, she was very eager to absorb the German provinces of Alsace and Lorraine, thus pushing her borders right up to the Rhine river. Thus Francis Stephen, Duke of Lorraine and Bar, was prevailed upon to relinquish his ancestral lands in favour of France and to become Grand Duke of Tuscany instead. Being already an exile in Vienna, he had everything to gain and little to lose from this proposition. Thus the future Holy Roman Emperor Francis I, from 1736 the husband of the Archduchess Maria Theresa, was provided with a handsome dowry for his bride. Austria was now established in an important portion in Italy. It had Lombardy, Tuscany and the three geographically-disjointed Parmesan duchies of Farina, Piacenza and Guastalla. Unfortunately Maria Theresa lost the Parmesan possessions in 1748 as a result of the peace settlements after the Prussian wars. Parma, like Naples, got another minor branch of the Spanish Bourbons as hereditary rulers. Yet Austria was not so easily dislodged. Maria Theresa overcame this setback to Austria’s Italian position by having her daughter Caroline marry King Ferdinand I of the Two Sicilies in 1768. This intelligent princess was to play a very important role as Queen, tying this kingdom firmly into Austria’s orbit. Parma, similarly, was doubly tied to Austria by the marriage of Archduke Josef (the future Emperor) to Louise of Farina in 1760, and by the marriage of his sister Amalie in 1769 to the reigning Duke Ferdinand of Parma. The Habsburgs acquired Mantua in 1708 when the previous Gonzaga Ducal family became insufferable. During this period Austria also acquired another important possession - the Duchy of Modena. This North Italian principality was brought into the Habsburg family by the marriage in 1771 of the Archduke Ferdinand, another son of Maria Theresa, to the princess Beatrix of Este, the heiress of Modena. Thus Modena, like Tuscany, became eventually a private domain of the Habsburg family. Indeed, by the end of the 18th century we can recognize all the Italian states that were to unite into the Kingdom of Italy one hundred years later. Venetia is a historical name for that part of Northeast Italy which was the Italian land portion of the Republic of Venice. In 1792, Austria under Francis I declared war on Napoleonic France. This continued on-and-off until 1797 when serious defeats forced Austria to seek peace. During this war, Mantua was besieged by Napoleon from June 4 until 31 July1796, and again from August 24 until in early February 1797 the city surrendered and the region came under French administration. By the Treaty of Campo Formio (17 Oct 1797) Austria gave up Lombardy (and all the territory to the west of the Adige River, so including Mantua) to Napoleon’s Cis-Alpine Republic. In compensation, Napoleon gave Austria the city of Venice (which he first had to invade: it didn’t take him long to overrun it and depose Ludovico Manin, the last Doge of the Venetian Republic), plus the Venetian territory east of the Adige, Istria, and Dalmatia. Austria joined Britain, Turkey & Russia to take advantage of Napoleon’s adventure in Egypt and re-declare war on France in March 1799. Mantua became Austrian again from 12 July 1799 to 16 Feb 1801. Napoleon returned from Egypt and re-established the Cis-Alpine Republic. By the Peace of Lunéville of 2 Feb 1801, Austria gained Trent & Brixen but lost Tuscany & Modena. On 9 Aug 1805, Austria joined with Britain and Russia who had started a war against France. As usual, initial successes were followed by failures. Following Napoleon's victories at Ulm (20 Oct) and Austerlitz (2 Dec) and occupation of Vienna (13 Nov), by the Treaty of Pressburg (26 Dec 1805) Austria gained Salzburg but lost Venetia to the Cis-Alpine Republic which Napoleon now relaunched as the Kingdom of Italy. Austria also lost Tirol & Vorarlberg to Bavaria, etc. Undaunted, Austria re-declared war on France on 9 April 1809 – with the customary outcome. Napoleon occupied Vienna on 13 May. The final Austrian defeat (in this round) was at Wagram. By the Peace of Vienna (alias Treaty of Schönbrunn) of 14 Oct 1809, Austria lost the Innviertel to Bavaria; South Tirol to the Kingdom of Italy; and Carinthia, Crain, south Croatia, Dalmatia and Istria to the new Kingdom of Illyria. Once more Austria re-declared war on France, on 11 Aug 1813: this time with more allies. After the Battle of Leipzig, Waterloo etc Napoleon was finally defeated and evicted. Venetia capitulated to Austria on 20 April 1814; on 12 June 1814 the annexation by Austria of Lombardy was proclaimed. The Congress of Vienna danced its way to a Europe-wide settlement, orchestrated by Metternich. After the defeat of Napoleon, the Congress of Vienna in 1815 set about the formidable task of restoring Europe as much as possible to its previous conditions. The old map of Italy was largely restored with the notable exceptions of the ancient republics of Genoa and Venice. The Congress’s Final Act of 9 June 1815 combined the territories of Lombardy (plus Mantua) and Venetia into the newly formed Kingdom of Lombardy-Venetia under a Viceroy of the Habsburgs. Austria also recovered the Tirol etc. Genoa was given to Sardinia. This settlement lasted until 1859, when Austria was militarily defeated by the combined armies of France and Sardinia in the battles of Magenta and Solferino, and the united Kingdom of Italy was created by Sardinia in 1861. The Congress of Vienna had made Italy practically the backyard of Austria. The different states were in various degree of dependence on Austria. Nothing demonstrates this more dramatically than the total and immediate collapse of the entire system of these so-called independent Italian states in the wake of the military defeat of Austria in 1859. Analyzing their position after 1815, one comes to the conclusion that Italy was divided into three parts. Part one: Sardinia, the spokesman of nationalist Italy, antagonistic to Austria and aspiring to replace her as the leading power on the Apennine Peninsula. Part two: The Papal States, ostensibly neutral but leaning toward Austria; with their archaic administration, the true representative of the ancien regime in Italy. A look at the map will show that the area of Austrian influence was large indeed. Yet it was the political weakness of Austrian Italy and the total ineffectiveness of the Papal States, rather than the extent of Sardinia’s military power, that led to the collapse of Austria’s influence in Italy. For a discussion of the other states, see appendix I. The Kingdom of Lombardy-Venetia was created by the Congress of Vienna in 1815. It consisted of Lombardy (the former duchy of Milan), Mantua, and the city plus the Italian territory of the former Republic of Venice. It was a part of the Austrian Empire; but unlike the others it was a separate political unit having a separate government headed by a viceroy (usually an Austrian Archduke), separate currency, finances, judiciaries and different postal stamps. In some aspects it was administered as two separate units: Lombardy from Milan and Venetia from Venice. Hence, the tax stamps were different until the 1850s when common ones were produced - just in time for the Austrian Empire to lose the territory! Lombardy was once an ancient Teutonic tribal kingdom rising on the debris of the Roman Empire, but had disintegrated in medieval times into various feudatories and independent cities. Despite this fragmentation, the Lombards always had something akin to a national consciousness, symbolized by their Iron Crown which every Holy Roman Emperor once had coveted. Since Renaissance times, the Habsburgs, first the Spanish line, then the Austrian line, ruled the Lombard lands of the Duchy of Milan. With the re-emergence in 1815 of the ancient symbolism of a Lombard kingdom it was hoped to counteract the influence of Pan-Italian nationalism by appealing to this regional patriotism. The Duchy of Mantua, a Habsburg possession since 1708, returned to them in 1814, becoming a part of Lombardy. The city was one of the Quadrilateral fortress cities in northern Italy. After a popular revolution on 22 March 1848, the Austrians fled from Milan, which become the capital city of the Lombardy Provisional Government. The next day, Venice also rose against the Austrians, forming the Venice Provisional Government. The Austrians, after defeating the Sardinian troops at Custoza (24-25 July 1848), re-entered Milan (6 August 1848) and Venice (24 August 1849), restoring Austrian rule. Agitation in Mantua against Austria culminated in a revolt which lasted from 1851 to 1855, and was finally suppressed by the Austrian army. The Congress of Vienna’s 1815 settlement endured until 1859, when Austria was militarily defeated by the combined armies of France (under Emperor Napoleon III) and Sardinia in the battles of Magenta and Solferino. Fear of involvement by the German states led Napoleon to seek a way out of the war, so he signed an armistice with Austria in Villafranca. Most of Lombardy, with its capital Milan, was to be transferred from Austria to France, which would immediately cede these territories to Sardinia. The terms were confirmed by the Treaty of Zurich – actually two parallel treaties, one between Austria and France, the other between Austria, Sardinia and France. The full texts, in parallel French and Austrian, are both dated 10 November 1859. The treaties carefully described the boundary between the transferred territory and that which remained Austrian. The "Oltrepo Mantovano", the part of the province which was situated south of the river Po and had received a Sardinian administration, was returned to Austria in the first days of December 1859. North of the Po, the boundary ran down Lake Garda, skirted the Austrian fortress of Peschiera at a radius of 3½ km, then followed the Mincio to Grazie, across country to Scorzarolo and along the Po westwards past Luzzara. This left Peschiera, and the city of Mantua, in Austrian hands. Since Mantua was classed as Lombardy, the Kingdom of Lombardy-Venetia remained in formal existence for some years. The rulers of Central Italy, who had been expelled by revolution shortly after the beginning of the war, were to be restored. However, these terms of the Treaty of Zurich never came into effect: by November the agreement had become a dead letter. The central Italian states were occupied by the Piedmontese, who showed no willingness to restore the previous rulers, and the French showed no willingness to enforce the treaty. The Austrians were left to look on in frustration. The next year, in 1860, with French and British approval, the central Italian states (Duchy of Parma, Duchy of Modena, Grand Duchy of Tuscany and the Papal States) were annexed by the Kingdom of Sardinia, and France took Savoy and Nice. The Kingdom of Italy was created by Sardinia in 1861. One source [A history of the Habsburg Empire 1700-1918", J. Bérenger, ISBN 0-582-09010-5; pages 189 (where ‘1868’ must be a misprint for 1866) and 199] states that Venetia had been ceded to the French Empire by a secret treaty of 11 June 1866 between Franz Josef and Napoleon III, intended to ensure French neutrality in the imminent Austro-Prussian war. 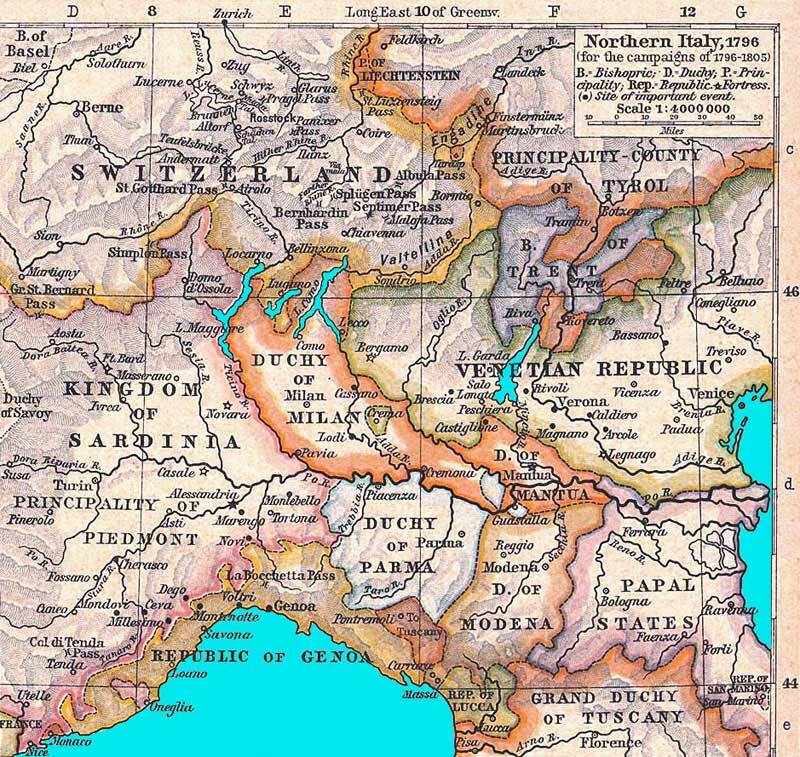 According to the Treaty of Vienna signed on October 3, 1866, the Austrian Emperor had at some unstated date ceded "the Kingdom of Lombardy-Venetia" (namely Venetia and the rump of Lombardy, ie eastern Mantua) to the French Emperor, who "was ready to cede it to the Kingdom of Italy". Article III of the Treaty stated that "his Majesty the Emperor of Austria consented to the reunion of the Kingdom of Lombardy-Venetia with the Kingdom of Sardinia". Thus ended the Kingdom of Lombardy-Venetia. On 6 Jan 1867 Franz Josef formally announced his decision to give up the title "King of Lombardy and Venice"; therefore in all dispatches, offices, oaths of allegiance, inscriptions on coins, seals, etc, the words "King of Lombardy and Venice" were to be left off. Of all the states and territories in Italy, only this state was truly independent, indeed in opposition to Austria. Its ruling dynasty, the House of Savoy, was native Italian. It took its origins in the relatively humble circumstances of a small feudal lordship in the Italian Alpine regions. Interestingly, their antagonists, the Habsburgs, took their medieval origins from like circumstances in the Swiss Alps. By cleverly playing off the French against the Germans and other Italians, and having the good fortune of choosing the winning side in every war, the Savoyan domains had increased throughout the centuries, eventually comprising about half of Northern Italy. With the acquisition of the Island of Sardinia in 1720, the Duchy of Savoy became the Kingdom of Sardinia and as such formed eventually the nucleus around which the modern Kingdom of Italy was to be formed. Its capital was Turin and by 1861 the country counted 5,167,000 inhabitants. After 1815, Sardinia continued for a while to pay homage to the conservative principles enunciated by the Congress of Vienna. In 1822 Austrian troops even entered Sardinia to help the Government quell nationalist uprisings. Yet Sardinia soon embarked upon a different course. As during the past dynastic struggles when the Savoyards had always had the good sense to back the winning party, they realized now that the present power struggle was not dynastic but political. The armies of France had left Italian soil, but the French revolution had remained with its legacy of nationalism. And it was Italian nationalism that was to be arrayed against dynastic legitimism based upon regional particularism. Thus Sardinia chose to become the spokesman for Italian nationalism rather than to identify herself with the other dynasties whose shaky thrones had to be propped up by the intermittent use of Austrian troops. Thus Sardinia once again chose the winning side. These, called Roman States in some stamp catalogs, were the secular territories of the Roman Catholic Church in Italy. Once the main source of revenue and power of the medieval Popes, they had shrunk considerably in importance and size. Nevertheless, they still constituted the sovereign political base of papal power. Inasmuch as the Church hoped for an eventual unification of Italy under the supremacy of the Pope, it came naturally at odds with Sardinia and thereby closer to Austria. Furthermore, as this aspiration was not compatible with the political facts of the early 19th century, the Church favored the "status quo" as an immediate political aim. This weakness in the face of widespread revolutionary activity brought it about that the Pope, in 1848, invited French troops to guard Rome and the Southern provinces, while Austrian troops were stationed in the Romagna. In 1859, as an immediate consequence to Austria’s defeat, the Romagna, about a third of the territory of the Papal States with such important towns as Bologna and Ravenna, declared her independence but acceded to Sardinia in the following year. Eventually all the Papal territories came under Sardinian control with the exception of the city of Rome. Only in 1870, with the departure of the last French troops, was Rome occupied by Italian troops, thus ending the last remaining vestiges of papal sovereignty. (In 1929 under entirely different circumstances the very small territory of Vatican City was again established as an independent sovereign papal territory.) The Papal States prior to their disintegration had 3,125,000 inhabitants. This dual state consisting of the Kingdom of Sicily (capital Palermo) and the Kingdom of Naples, with the city of the same name as capital, had about 9,250,000 inhabitants. Thus it seemed a large and formidable state. Yet it was weak, poor, and backward, with little industry and commerce. Their rulers, a minor branch of the Spanish Bourbons but closely related to the Austrian Habsburgs, could never claim the loyalty of the native population, who always regarded them as foreigners. Indeed, the Congress of Vienna was seriously considering to dispose of this state altogether, but the fact that Ferdinand II, who was about to become king, was the son of the energetic Queen Caroline, Empress Maria Theresa’s indomitable daughter, probably saved his throne. Austrian troops were frequently stationed in the Two Sicilies to help suppress nationalist uprisings. Needless to say, the policies of the Sicilian Kingdoms were completely attuned to Vienna’s and this state can practically be considered part of the Austrian establishment in Italy. Despite its history of weakness and instability, it was indeed an ironic anticlimax that the last king, Francis II (1859-1860), relinquished his crown only after a heroic, protracted but futile struggle against the Sardinians and the insurgents. It was the only Italian state that had offered a serious military challenge to Sardinia after Austria had already been defeated. The Queen, incidentally, was a sister of Empress Elizabeth of Austria. This North Italian principality had a background somewhat similar to that of Southern Sicily. It too had originally emerged from the Austrian acquisitions in Italy during the 18th century, and it too was ruled by a minor branch of the Spanish Bourbons. During the Napoleonic wars, however, the Parmesan rulers had collaborated with France, as a result of which the victorious powers at the Congress of Vienna in 1815 deprived them temporarily of their possessions and gave the Duchy of Parma as a life-time endowment to Napoleon’s estranged wife, the former Empress Maria Louise, the daughter of Austria’s Emperor Francis I. After her death in 1847, the House of Bourbon-Parma was again permitted to return. This dynasty was extremely unpopular, which led to violent opposition and repressions and culminated in the assassination of Duke Charles III. Parma was then ruled by a regency for the infant Robert I, until it was overwhelmed by the results of Austria’s catastrophe of 1859 and annexed by Sardinia. Parma was a small state with less than 500,000 inhabitants; its capital was the city of Parma. Far more than Sicily, it was totally dependent on Austria with whom it also had a common border. Quite frequently Austrian troops had to be stationed there. As a footnote it is worth mentioning that the dynasty took exile in Austria after 1859 and many years later, a daughter of Duke Robert by the name of Zita became Austria-Hungary’s last Empress and Queen. The Tuscany that fell to the House of Habsburg-Lorraine in 1738 already could look back upon a proud and important history in Italian affairs. For it was Tuscany, the birthplace of Dante, Michelangelo, and many of the other giants of the Italian world of art and culture, with her incomparable capital of Florence and important cities like Siena and Pisa, that became now a repository of Austrian dynastic power, but not a province of the Austrian State. Sensible to the inherent difference between this new possession and the old Austrian hereditary lands (die Erbländer), it was never incorporated into the Austrian State, but dynastically reserved for the second hereditary line (secundogenitur) of the House of Habsburg-Lorraine. Tuscany was a private domain of the Habsburg family, but completely apart from the administration of the Austrian State. These constitutional appearances notwithstanding, Tuscany belonged firmly to the Austrian establishment; something more than just a sphere of influence, but something less than an Austrian province, and remained in this situation until 1859, when the last reigning Grand Duke Leopold II was forced to flee to Austria because of the events resulting from the battles of Magenta and Solferino. Tuscany was subsequently annexed by Sardinia. Unlike most of the other states, this was a well-administered and wealthy state, and at the time of its annexation counted 1,790,000 inhabitants. This state, too, was a patrimony of the Habsburg family. Since the 15th century the famous House of Este had ruled in Modena. With the marriage of the last Este heiress Marie-Beatrix to the Archduke Ferdinand of Austria, this Duchy passed into Austrian hands. Archduke Ferdinand, a younger brother of Emperors Joseph II and Leopold II, thus established a new Habsburg line of Austria-Este. He did not live to see the end of the Napoleonic wars, but the Congress of Vienna re-established Modena, similarly to Tuscany, as an independent state but a private domain of the Habsburg family. With the collapse of Austria’s position in Italy, it fell to Sardinia in 1860. A small but prosperous state of less than 450,000 inhabitants, it included such important territories as the Massa di Carrara and since 1815 Guastalla. There were also two sovereign principalities re-established in 1815 that will not be found in any stamp catalogue because they disappeared before the philatelic age was ushered in. One was the Principality of Massa di Carrara that was in 1790 incorporated by marriage into Modena, and the other was the Duchy of Lucca that was absorbed by Tuscany in 1847. For an abundance of information on the tortuous history of both see Wikipedia! To round out the picture of Italian states one must add the Republic of San Marino, aloof and perennially unperturbed atop Mount Titano, an independent state for many centuries until this very day, located not far from the Adriatic Coast near Rimini. This state was founded in pre-Roman times! By 1806, the Republic of Ragusa had existed for several centuries; its capital was Ragusa also known as Dubrovnik. Then, besieged by the Russian fleets, Ragusa surrendered to Napoleon who entered at the head of his army. In 1808, the French abolished the Republic of Ragusa and amalgamated its territory into the French Illyrian Provinces. On 27 January 1814, the French capitulated and their troops marched out of Ragusa; the next afternoon Austrian and English troops entered. At the Congress of Vienna in 1815, Ragusa was made a part of the crown land of the Kingdom of Dalmatia, ruled by Austria-Hungary.